It’s Christmas! Advent calendars are being opened, Santa has begun packing his sleigh and GSA Learning Resources have installed a colourful selection of Christmas cards and books on the top floor of GSA library! 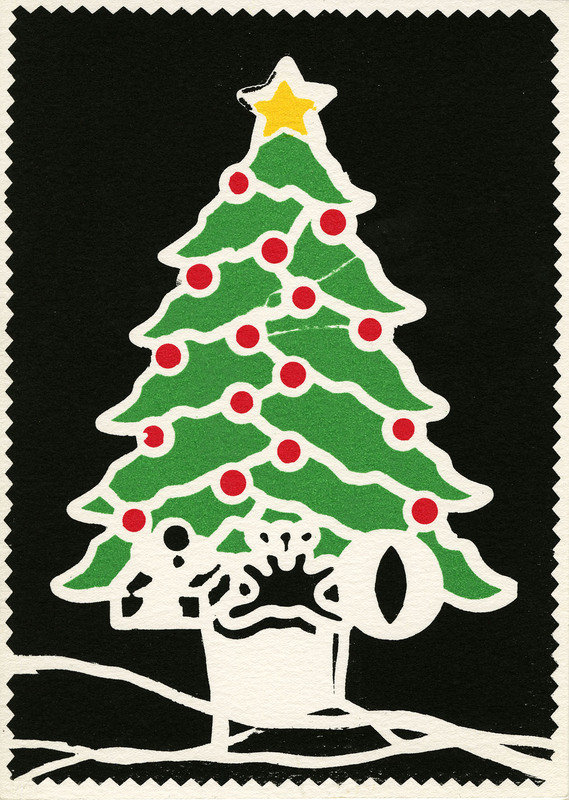 GSA Archives and Collections are no stranger to a handmade Christmas card having collected several batches over the years! We couldn’t resist choosing a few favourites from our Conrad McKenna, Kath Whyte and Bob Finnie collections to display and get students into the festive spirit! Discover a little information about each of these individuals below and get in touch by emailing archives@gsa.ac.uk if you would like to see more! Conrad McKenna became a student at GSA in 1939. His studies were interrupted by WW2 where he served in the RAF from 1942 to 1946. 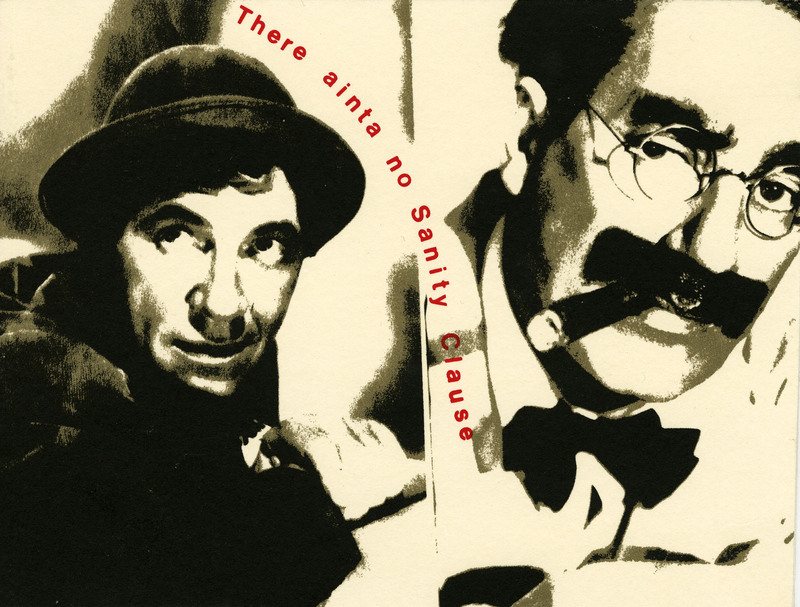 He then returned to art school where he was awarded a diploma in Commercial Art in 1948. He became a member of staff between 1950 and 1984 where he taught in various departments and courses across the School, including the Design and Crafts department, the Evening School and on the General and First Year courses. 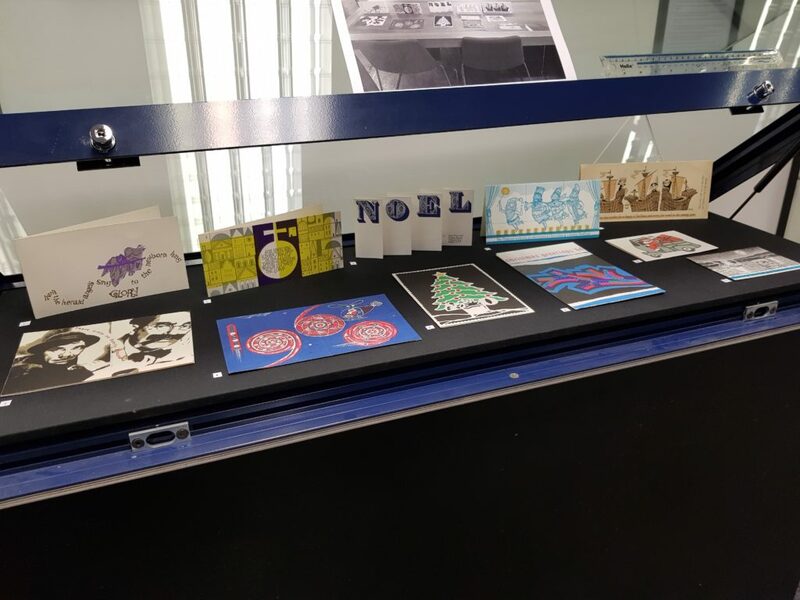 In addition to McKenna’s teaching materials, GSA Archives and Collections hold an impressive stash of approximately 70 Christmas Cards that he collected during his 45 years at GSA. Most of these were designed and handmade in house by McKenna and other GSA staff, including; Gordon Huntly, Rosalind Bliss, Michael Moulder, Peter Sumsion, Michael Healey, Mark Severin and James Cosgrove. 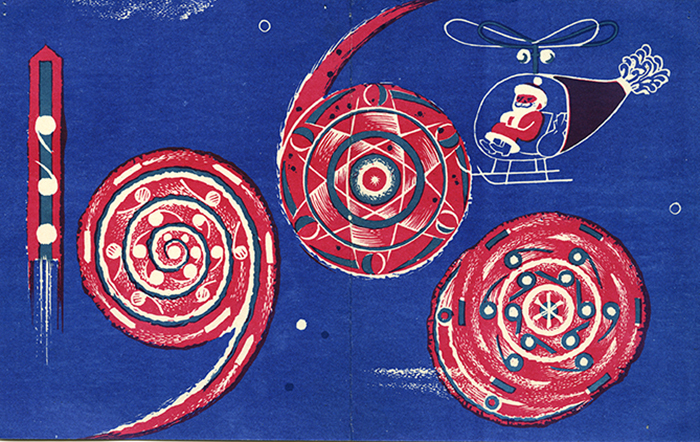 We hope you’ll be pleased with the ones that we selected – we especially love helicopter Santa! Kath Whyte was brought up in a home where “real” things such as hand-made textiles, books and pictures were loved and appreciated. Some of her formative years were spent in India, where her father worked, from where the rich colours and exciting textiles obviously made a lasting impression. She studied at Gray’s School of Art in Aberdeen where she developed a true dedication to stitchery and textiles. This eventually lead her to become Head of Embroidery and Weaving at GSA between 1948 and 1974. 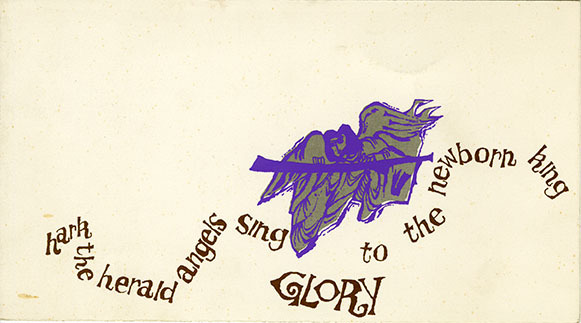 Our Kath Whyte collection at GSA Archives is vast, mainly consisting of Whyte’s personal papers which contain these Christmas cards. Robert (Bob) Finnie was a student at The Glasgow School of Art c1952-57. He was awarded a diploma in Printed Textiles and a post diploma award in the same. 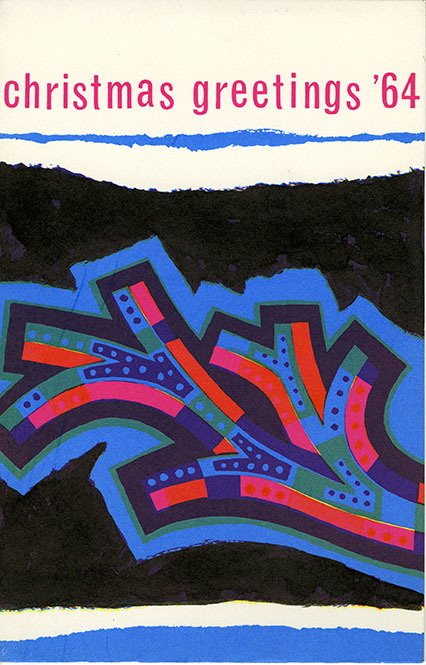 He lectured in Printed Textiles from 1958 to the mid-seventies. He was promoted to senior lecturer and opted to become part of Fine Art in the Department of Printmaking. Here he was instrumental in setting up a pilot Fine Art photographic area in anticipation of the creation of a new degree in Fine Art Photography with the appointment of a new head of the same. 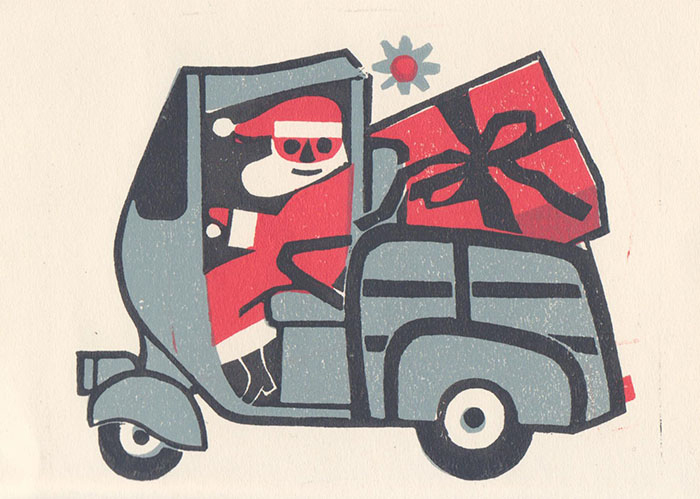 Bob kindly donated several Christmas cards to GSA Archives earlier this year, some of which he designed himself.